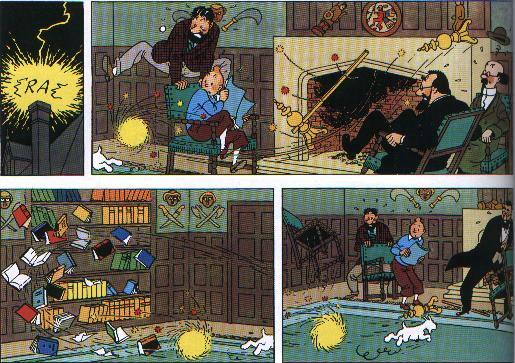 Whereas Tintin finishes to read this text, a ball of fire enters by the chimney of professor Bergamotte and after having made fly Calculus, it disintegrates the mummy of Rascar Capac. This phenomenon is transitory and unforeseeable. If one didn't have many testimonys and (very) rare photographs, it would be regarded as a hallucination. It is estimated that 5% of the world population attended the formation of one of these anomalies. What is sure is that, as us Hergé in The seven crystal balls shows it, the appearance of the globular lightning (thus call it the scientists) is related to the storm. According to the specialists, a flash on a million gives place to a « ball of fire ». According to the observations, these balls are red, yellow or blue. Their average diameter is twenty centimetres (8 inches), they even last ten seconds to the maximum one minute. They generally move horizontally, with five meters a second, but can also remain motionless or vertically rise. The witnesses often mention a bad smell, comparable with that of ozone (O3) or nitrogen dioxide (NO2), that professor Calculus associates sulphur (?). The ball can slowly or in a rapid explosion die. One doesn't know yet really what causes this phenomenon and several researchers affairent themselves there. The theories are very diverse, and some even affirm that one can artificially create them with a microwawe oven. The most probable assumption and most recent was emitted by two Dutch physicists. According to them, when the lightning touches the ground, released energy causes a chemical reaction between the silica (SiO2) contained in the rocks and carbon (C) contained in the plants. One notes this reaction as follows : SiO2 + C -> Si + CO2. It is thus formed carbon dioxide, which one doesn't present, and of the pure silicon chains. These chains tend to be folded up on themselves to form balls. Moreover, they burn rather slowly. Thus, a « ball of fire » is formed. Lastly, the hot air that it contains raises it (because the hot air is less dense than the air at ambient temperature) and the ball in fusion derives, thorough by the wind. It is only one assumption but it is credible. To return from there in Hergé, it respected several characteristics strictly : the storm, the color, the diameter, duration, the explosion. But the levitation of this poor Calculus remains purely imaginary !